Apple Deleting iBook Logic Board Failure Posts? 55 Operating Systems on a PowerBook 17"
AppleInsider reports that at least one person has had postings about his iBook failures removed from Apple's discussion boards, which repeats a practice they have used in the past. "A significant amount of anecdotal and technical evidence has emerged since the Dual USB iBook's release in May 2001 which points to common failure of the logic board. In some instances, Apple has replaced iBook logic boards up to three times, when the machine has been under the AppleCare extended warranty. "It's interesting though, that having paid for a premium product, such as Apple, we expect better quality. Even when we pay just $999 for an iBook." "For the record, IBM says it hasn't heard of any G5 laptop plans. And Apple, as usual, says it can't comment on products in development. But Apple watchers and chip experts say all the pieces needed for G5 laptop are coming together. "The simple solution to all of these problems is to introduce a low-power, slower-speed chip specifically for laptops...."
"I have successfully installed Panther (Custom install, sans languages, iMovie and printer drivers, etc.) on a late release 14" TFT WallStreet G3/233 with 384 mb of RAM. It has an IBM/Hitachi 40 GB 40GNX 5400rpm drive, with a 3 GB partition for Panther and 9.2.2 on the remaining larger, second partition. I've had none of the magnet/sleep problems others have discussed . . . either with this drive or the previous IBM/Hitachi 20 GB 4200rpm 40GN drive. In fact, Sleep and Wake from Sleep function perfectly on this WallStreet in Panther both with the screen closed and open. "Panther looks and works more smoothly than one could ever expect from a G3/233. Not as snappy as 9 of course, but it runs iTunes 4 and talks to my other OSX 'Books for printing, so I'm happy I could make the upgrade"
Have you ever taken a look at the ethernet port on your dual-USB iBook? All it would take is an errant pen or pencil in your notebook bag to bend the ethernet port pins enough to render the port unusable. The other ports are also easily damaged, and notebook repairs are expensive. Shinza's transparent silicone port caps can protect your iBook from damage as well as preventing dust and other grime from accumulating in your ports. The soft material is translucent so that all the ports and icons are visible, and it can also be cut with scissors if desired to protect the individual connections you use least often. Shinza.com and CoolStream have announced the immediate US launch of the iSweet FireWire Web Camera, a unique combination of form and function that combines impressive video performance with a stylish design not seen in other webcams. Despite its tiny three-inch size (it literally fits in the palm of your hand), the iSweet packs a high-resolution Sony 350,000-pixel CCD in its chrome and white acrylic body, delivering 30 frames of smooth video per second at 640 x 480 resolution. The iSweet comes with a unique clip for attaching the camera to the top of your PowerBook or iBook, where it can then be swiveled and tilted in all directions. For desktop users, the included mini-tripod makes it easy to put the iSweet on top of a monitor or desk. One look at the white plastic carrying case reveals how much attention to detail went into the iSweet's design. This small carrying case holds the iSweet camera, notebook clip, matching FireWire cable, mini-tripod, lens cloth, and a soft drawstring carrying pouch. All of these components fit neatly and tightly inside the specially designed carrying case. The $129.95 iSweet is completely plug-and-play. Just plug in the iSweet, and iChat AV automatically launches and makes itself instantly available for video chats. The iSweet can also be used in many other software applications, including QuickTime Broadcaster, Yahoo Messenger, BTV, iStopMotion, and iVisit. Willow Design has introduced five new sleeves to minimize the size needed to protect and sheath Apple's PowerBooks and iBooks. At just over half an inch bigger than each notebook, each sleeve is as small as possible while still offering good protection. They easily slip into another bag or briefcase - but can also be carried safely as a portfolio or over the shoulder with the convenient shoulder carry strap. The Minimus Sleeves' protection is afforded by quarter-inch soft foam reinforced by outer high density plastic outer panels. There is also an extra layer of foam sandwiched around the perimeter where the notebook is most likely to get bumped. The tight tolerances make for a surprisingly solid case in such a small size. As with all other Willow slipcases, backpacks, dust covers, and desktop carry cases, the new sleeves are covered by Willow's 100% satisfaction guarantee and lifetime guarantee against defects in materials and craftsmanship. A compact, clean, protective sleeve. Reasonable protection for your Powerbook or iBook afforded by 3 mm (0.25") soft "gushy" foam with an extra protective 3mm foam layer sandwiched around the perimeter of the case. Additional protection given by a very thin, stiff layer of high density polyethylene. Convenient 1" (25mm) shoulder strap. Flat rear zippered document pocket. Willow has been producing laptop, notebook, and larger computer carrying cases since 1988, focusing on providing the highest standard of protection, comfort, and durability. Willow is the only manufacturer to make a range of cases to protect the entire current range of Apple products and accessories from the iBook to the G5 towers. All Willow cases are backed up by a 100% satisfaction guarantee and lifetime guarantee against defects in materials and craftsmanship. You can count on superb protection, functional ergonomic designs, and meticulous craftsmanship. Put together, this means you will be assured of great value for your carrying case dollar. Willow's 2003 year end inventory overstock sale offers the opportunity for even better value with with special prices on select items and half price shipping by UPS ground in the United States and Canada for the selected items to Dec. 23. Sale prices are effective to December 30, 2003 and subject to availability. Trans Intl. today announced the availability of an industry first. The Enhance 7200 RPM Mobile Hard Disk Drive for 24x7 data-ready environments in a 2.5" form factor. This drive offers enhanced features compared to standard mobile drives used in portable computers. The drive never sleeps. The enhance 7200 RPM drive is designed to allow users to leave it powered on around the clock. Supports a read/write duty cycle of up to 50 percent more than twice the level supported on standard mobile drives. The New Enhance Mobile 60 GB 7200 RPM drive is also available as an external FireWire/USB portable Disk Drive featuring the fastest sustained data transfer rate of [27-40 MB/s] enabled by an OXFORD 911 Fire Wire bridge chip. ThermographX monitors the temperature sensors inside your modern G4 or G5 Macintosh. Added MacPAD support for automatic update notification. Updated with latest user-submitted temperature measurements. System requirements: Mac OS X 10.2.4 or higher (Panther compatible); requires a Macintosh with compatible thermal sensors (so far, these have been found on the iBook G4, Aluminum 12", 15" and 17" PowerBooks, the "mirror-door" G4 and the G5, and some G3 PowerBooks and G4 Cube models). QuickerTek, developers of PowerBook antennas for Titanium PowerBooks and external antennas for both the Graphite and Snow wireless base stations, is now shipping their "Plug N Play" external antenna that works with Apple's AirPort Extreme Base Stations (Extreme with USB and External Antenna port). The Plug N Play typically increases signal line-of-sight distance to an average of 600 yards, and makes it easy for users to install their own antennas, using external antenna ports. The "Plug N play" is priced at $89.95 and is available immediately. The Plug N Play antenna does not require any base station modifications or installation software. The Plug N Play includes a 5Dbi Omni directional antenna along with the necessary cabling, bracket and installation instructions. QuickerTek also includes a CD for measuring your wireless system performance. The G5 BlueTooth Extension cable allows G5 owners to improve Blue Tooth range and place the desktop computer conveniently without sacrificing range in the Bluetooth pico net. This product is available at $54.95 and is also available for immediate delivery. "Customers who've bought our other Antenna products have been thrilled with the performance improvements," said Rick Estes, President of QuickerTek, "and now we're providing a high performance Extreme antenna at a truly affordable price. QuickerTek strongly recommends that owners of Titanium PowerBooks purchase a Whip Antenna along with there Extreme Plug N Play. 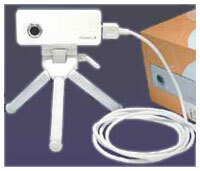 QuickerTek is the recognized leading innovator of Antenna's for Apple products. With their Ti book antenna's, antennas for Graphite, Snow and Extreme Base Stations, and the only company with Antenna's for the new G5 desktops. Dr. Bott is now shipping TiCase15 II for 15" Aluminum PowerBook, offering the ultimate protection for your new PowerBook in an elegant, brushed aluminum briefcase. TiCase15 II is the latest member in a complete family of high-end, durable cases providing exclusive features to all PowerBook G4 models that have been made to date. The inside of TiCase15 II is designed specifically for the PowerBook 15" user. Matching cutouts hold the power supply, power cable, and accessories. There is even a slot for your favorite MP3 player, the iPod. The TiCase15 II is designed so that it can only be opened when it is right side up. This prevents your accessories from tumbling out when you least expect it. 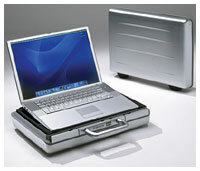 The detachable cover allows you to use the PowerBook while it is in the case using special "Lift-o-Matic" rear pads. These risers provide access to the rear ports while adding an ergonomic tilt to the keyboard and providing ample air circulation under the laptop. The total combined weight of TiCase15 II, PowerBook, power supply, and power cable is less than 12 lbs. TiCase15 II retails for $429 and is available from Dr. Bott and its authorized resellers worldwide (including the Applelinks Think Different Store). Dr. Bott also makes TiCase12 for 12" PowerBooks as well as TiCase17 for 17" PowerBooks. TiCase12 retails for $399. TiCase17 retails for $549. Acme Made introduces the all new iCover II with design improvements to improve ease of sliding on and off. One size fits both the titanium and the new aluminum 15" PowerBook models. The PowerBook and iBook iCovers are designed to protect your laptop's display from oil and dirt that is transferred from the keyboard when the machine is closed. Additionally, the wrap-around design also provides additional protection to the outer case. A special (non-leather) micro suede is used that feels great and is 3 times stronger than leather, washable, and water & stain repellent. Yet, it is still thin enough to close the unit without putting undue pressure on the hinge. The new iCover II also incorporates mesh side panels that allows the iCover to slide on and off even easier. Additionally, the iCover is soft enough to use as a cleaning cloth on the display as well. Constructed entirely in the United States. Tune Belt have just introduced a really unique armband case for Apple's latest iPods. The innovative design is engineered to fit iPods in upside down so that when the arm is raised slightly with the flap open the LCD reads right side up. The design features open access for the touch wheel and touch buttons, a clear protective window for the LCD, an opening in the bottom for the headphone jack or remote cord to come out and a zip pocket on the flap for personal items and the earbud headphones when not in use. A diagonal reflective accent strip enhances the sleek look even more and provides nighttime visibility and safety as well. The arm strap is easily adjustable with one hand up to 20". Armband size is easily adjustable with one hand up to 20"
The arm strap is easily adjustable with one hand up to 20" and the case is available in black and royal blue. "I run a large number of operating systems on my PowerBook 17, both because I am fascinated by operating systems and environments, and also because a lot of my professional work is and has been in this area (in other words, I legitimately need to run quite a few of these systems). It is helpful to think of the setup as an "iPod of Operating Systems" - I use a portable external FireWire drive that contains all the systems. "This page contains brief descriptions of almost all systems resident on my PowerBook. Note that these are not installation instructions: for each system, I have only noted uncommon actions (hacks, kludges, tweaks etc.) needed, if any, to make the system install and work. With the exception of Mac OS 9 and Mac OS X, all systems listed are x86 based, which would require using an emulator like Virtual PC, which at the time of this writing is pretty much the only production level x86 emulation option for Mac OS X (well, there is Bochs, and then there is (was) the 'was soon to be released for OS X but turned out to be vaporware' Real PC from FWB Software, etc., but none so comprehensive (yet) as Virtual PC). By the way, I do use Bochs on OS X once in a while. "...Some are there for nostalgia. Some are frivolous (consider EmacsOS), and maybe even ludicrous (consider 'HanoiOS within VMware within Linux within Virtual PC within Mac OS X'). If you must have a number, well, there are screenshots from at least 55 (perhaps more) different systems...."
This is an introduction to Mozilla, a manual for first time users for users of Mozilla in a corporate/educational/enterprise environment. The manual provides an overview of key features of Mozilla, with a focus on Navigator (browser), Mail, and Address Book. Although written with the business audience in mind, this manual is also intended to be useful as a quick overview for new users of Mozilla who may not be familiar with this software. This manual is intended for Mozilla end-users who have already had Mozilla installed and configured for them. The manual is based on Mozilla 1.5, and will be produced in PDF format for printing, or for posting to an intranet. The document is being created in Star Office 7. Star Office will also be used to generate the final PDF file. The Star Office source files will be made available (if you don't have Star Office, you can also use the free Open Office). Trans Intl Ultra Compact Portable FireWire F400 hard drives are now offered with a new faster "Next Generation" FireWire Bridge controller [OXFW911 interface chip]. This almost doubles the data transfer rate compared to earlier FireWire Portable drives. The new bridge controller delivers faster Data Xfer Rate [20-35 MB /s] making these drives more practical for data intensive applications. These FireWire portable drives are offered in capacities of 80 GB, 60 GB, 40 GB, 30 GB and 20 GB. Hot Pluggable/Hot Swapable Technology. This feature allows the FireWire Portable drives to be Plugged or Unplugged without turning-off or restarting the computer. The drive mounts automatically when plugged in to the FireWire Port of the computer. FireWire Bus Powered. No external power supply required - most Powerbooks can supply power via built in FireWire Port. The FireWire Portable drive can be powered directly by the FireWire Port. Transfer Rate fast enough [20-35 MB/s] for broadcast-quality video authoring and video capturing. Swapping data from the Portable to the Desktop. Archiving and retrieving data. Dual FireWire Ports/ One USB 2/1.1 Port. Derman Enterprises has announced a free update to KMremoteControl, the cross-platform program that lets you use one system's keyboard/mouse to operate all the PCs and Macs on your desk. KMremoteControl requires Mac OS X 10.2.x/10.3.x or Windows 2000/XP. A trial version can be downloaded from the Derman website and licensed for $24.95 USD for a two-license starter pack.